A couple days ago I ate a very aromatic porcini soup at one of my favourite restaurants and I was very surprised when the chef and owner told me where the mushrooms for this wonderful meal came from, the desert. The dunes of the Kalahari in southern Africa produce sensational truffle and porcini in season from now till May. I savored this dinner together with my family and we were all surprised and impressed at the same time! I’ve never seen mushrooms from the Kalahari in a store or at the markets before but I will definitely look out for them! The soup was so tasty that it aroused my appetite for mushrooms and I had to think of a lentil soup my aunt Ursula had told me about (she was at the dinner as well). It combines the earthy flavours of lentils and porcini. I went for dried porcini (from Italy not from Africa). My aunt recommended them for this meal as you have to shred them finely into a very concentrated porcini flour which you cook together with the lentils. I used my Swabian Alb Leisa Lentils from South Germany for this meal which conveniently don’t need to soak in water. Their taste is strong enough for the aromatic porcini, so strong that I could even add a piece of ginger, some thyme sprigs and a spoon of honey. The result is an absolutely delicious lentil soup full of wintery aromas. This is great to cook in large batches to keep in the freezer for quick dinners! In a large pot, fry the onion and garlic in a little oil on medium heat until golden, add some more oil and the shredded porcini and fry for 1 minute. Add the lentils, ginger, thyme, bay leaf and the broth. Don’t season with salt yet or the lentils will stay hard. Close the lid and let it cook for about 30 minutes. The cooking time depends on the lentil type, mine needed 30 minutes. When the lentils are soft, add the honey, season with salt and pepper and take out the thyme sprigs, bay leaf and ginger. 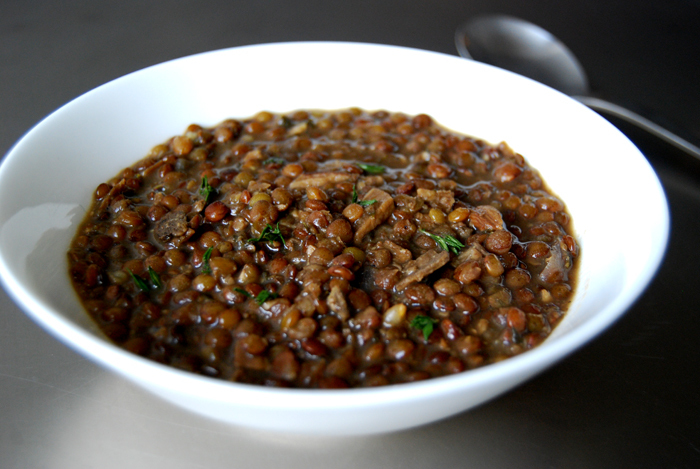 Lentils are one of my favorite foods…you can do so much with them. I will definitely be trying this soup. I have dried porcini mushrooms in my pantry, always have lentils! Thanks for sharing, Meike. Your welcome Marigene! 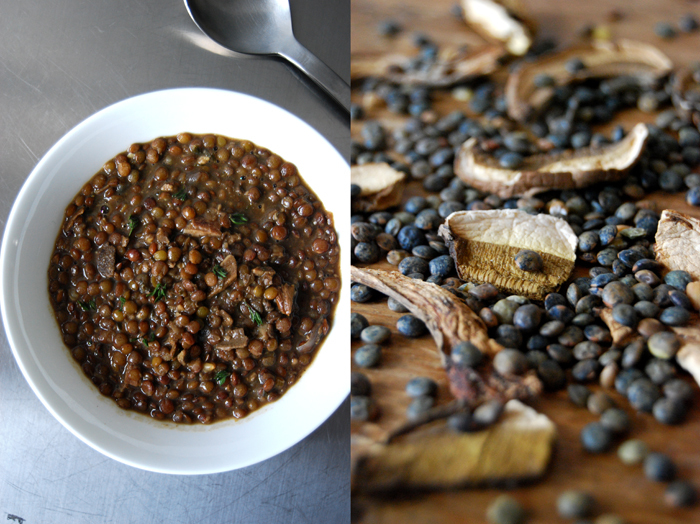 I love to cook with lentils in all their variety, black, brown, green, yellow, and they all taste different. My small dark lentils from the South of Germany fit perfectly to the mushrooms, and it’s so quick to prepare!